"Time to write my own f*cking story"
When Westworld was released it was by far one of my favourite shows of the year, I absolutely loved it! This love was in large part due to the phenomenal performance of Thandie Newton as Maeve, who I now consider one of my favourite TV characters. Thandie is incredible in this role and is honestly the show's greatest asset. 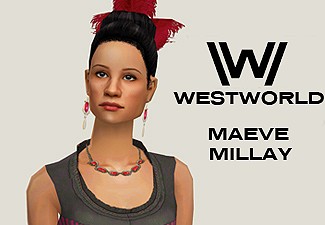 Maeve is a host within the Westworld park, who works as a brothel madam in the local Saloon. During the series Maeve begins to question her reality eventually launching a full scale rebellion. Westworld took a bit of a dive in season 2, but I still wanted to make some of the characters, and my hopes for season 3 remain high nonetheless! Thandie's face has been a challenge to try and recreate (and I must admit I cheated and edited her sculpt in Milkshape! ), but hopefully you will agree I have quite successfully captured her likeness. 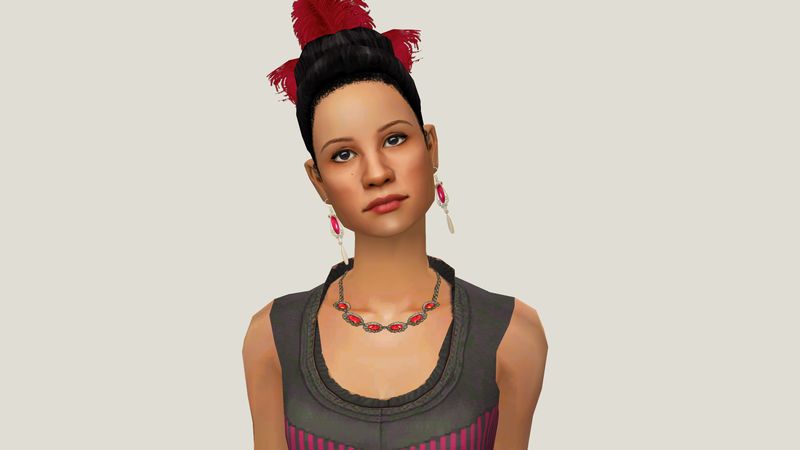 Maeve's necklace uses a mesh from LianaSims, which you will need to download here. 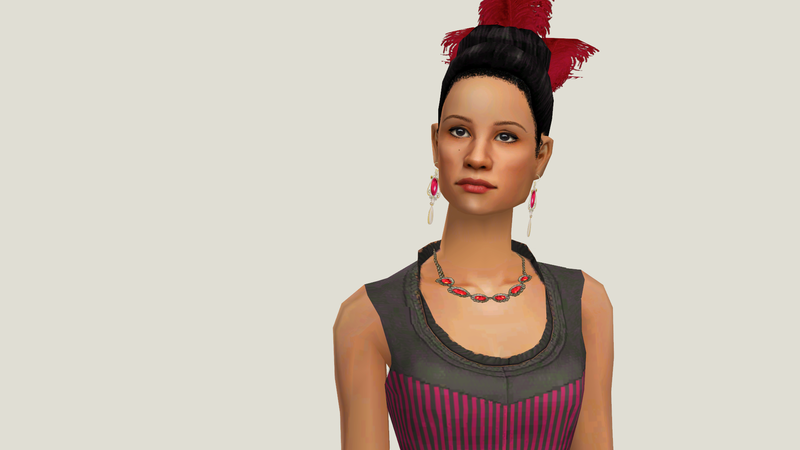 The earrings use a different mesh by LianaSims, which can be downloaded here (all of the earrings on this page contain the required mesh). The skinblend I have used on Maeve is by me and is available on my tumblr here. It contains textures from Needlecream, Lilith, Mouseyblue, Trapping and Adalae. The specific edit used on Maeve has an edited scalp texture to blend into her hairline better! Maeve's eyebrows are a pair of edited SimpleLife brows edited by me, they come in one colour and are not binned. 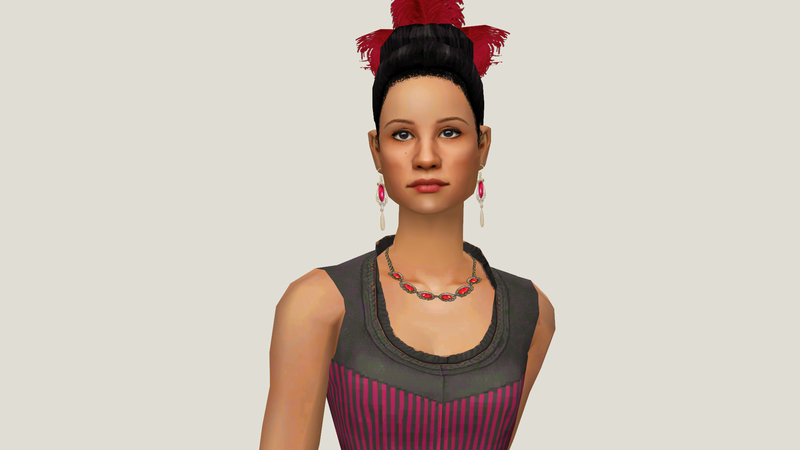 I had such a fun time recreating Maeve's Saloon outfit from the show, it's a absolutely gorgeous piece of costuming! The dress is a frankenmesh by me, consisting of the following: AllAboutStyle's Saloon Gal Skirt (edited to be longer at the back and be more shapely), Skellington's Dolores Dress Top, Yuxi's Heeled Boots from their sweater dress, and the bow from DeeDee's 3t2 Beautiful Bowed Dress. 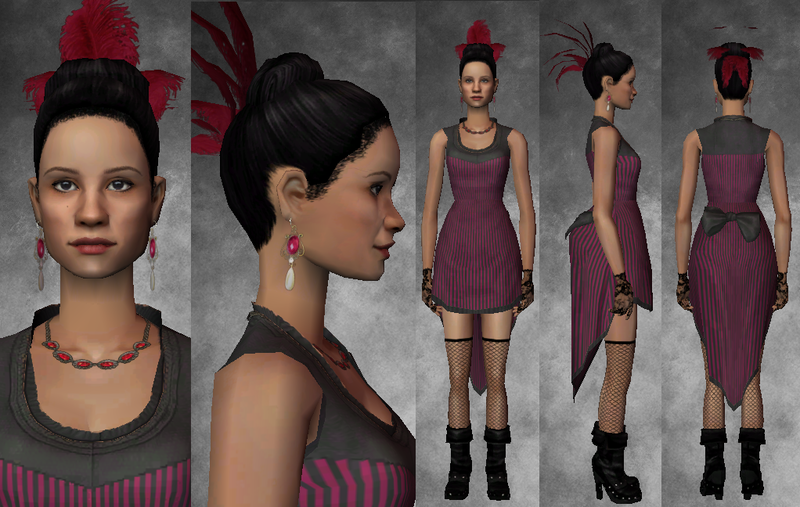 The dress uses textures from me, Skellington, Yuxi, Bloom, e-neillan and EA/Maxis. 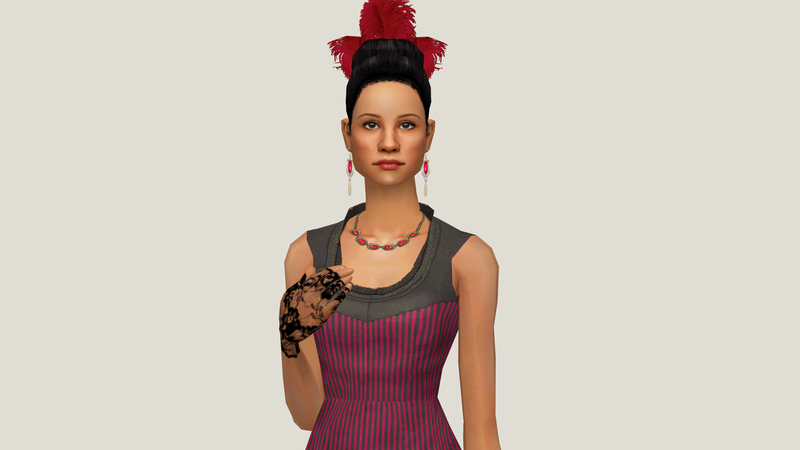 The version of the dress which is packaged with Maeve has gloves by Bloom on it, however the separate download (8 recolours) does not include the gloves, as I thought they would be more easily used by other people without them. Please note that in certain positions/poses and in certain animations there is some slight clipping that occurs in the bodice, however it shouldn't be too noticeable! Maeve's 'Madam Hair' is a frankenmesh by me consisting of TheNinthWave's Granny Bun and Lidiqnata's Rococo Hairset Feathers which I resized to fit the hair better. The feathers are a bit larger than those worn by Maeve in the show, so this hair is more 'inspired by' Maeve's hair in the show than an exact replica. Also thank you to MTS for being awesome and hosting this download!